FREE EVENT: Bring fido to Fat Tuesday and enjoy sweet treats! YUM! This is fun for you and your furry friends. SCOTTSDALE, AZ — You may want to celebrate Mardi Gras, but you dogs will want to celebrate "Mardi Paws!" 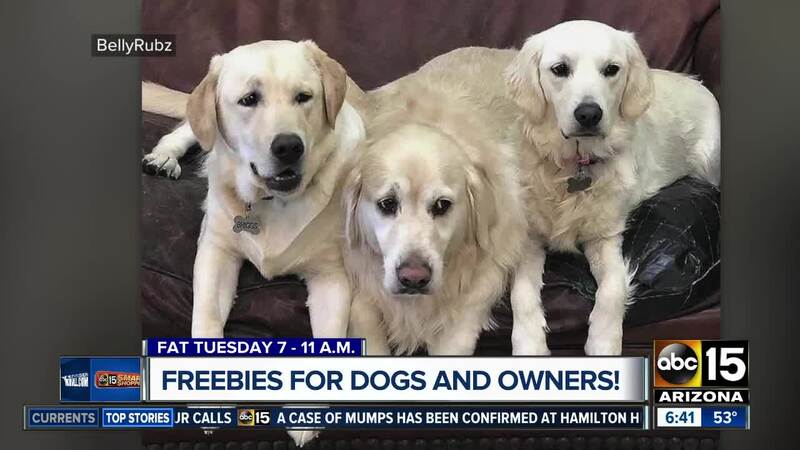 BellyRubz Doggy Playclub and Spa in Scottsdale wants you to bring your pups on Fat Tuesday. On March 5, from 7 to 11 a.m., all dogs, big and small, get to devour complimentary and delicious doggy treats, all while you enjoy free donuts and coffee. You will also get a chance to win a free day of doggy day care. Plus, BellyRubz will offer discounted daycare and boarding package pricing during this special event. The furry and fun-filled client appreciation celebration is sure to be a tail-wagging good time! Sunday, 8 to 10 a.m.
BellyRubz has been in business since 2005, offering dog day care, pet grooming with customized baths and haircuts, and overnight boarding with 16 spacious suites available for dogs. The grooming services include: nail trimming, ear cleaning, expressing glands, shampoo and conditioners. The owners, Sara and Bill Kelley also want the public to know that grooming is now available on Saturdays and Sundays, and they groom cats as well.